Well that's one way to make a deposit. 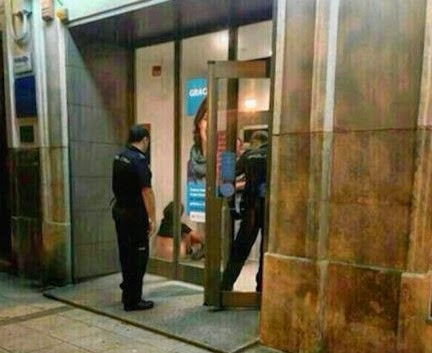 A Spanish couple was busted in flagranti next to a cash machine in Oviedo this week, but not before a large cheering crowd gathered outside the bank. Naked but for their socks, the couple's copulation quickly went viral as passersby posted photos and videos to Twitter. Although the windows apparently began to steam up, voyeurs were still able to take extremely explicit selfies with the naked duo in the background. Unfortunately the cops came before the couple did, but the Sun reports they got off with just a warning and a very public walk of shame.